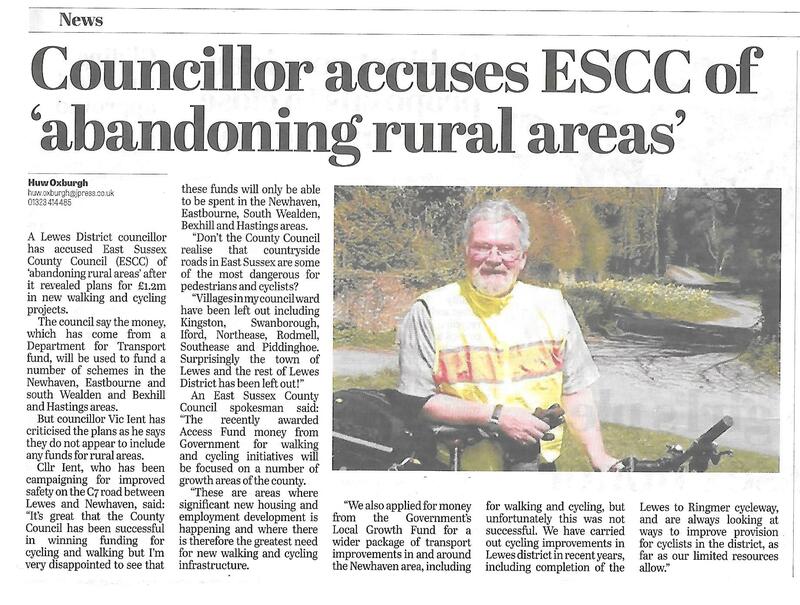 Where is ESCC Rural Cycling & Walking Investment? Albeit with much reduced funds, the government, last year, called for bids from county councils for both capital and revenue projects covering cycling and walking. Unlike West Sussex, East Sussex County Council simply did not bid for the capital funding. However they did bid for revenue funding. However, having won the money they decided to focus all of the investment in the coastal urban areas leaving out the towns and villages in our countryside. It’s great that the County Council has been successful in winning funding for cycling and walking but I’m very disappointed to see that these funds will only be able to be spent in the Newhaven, Eastbourne, South Wealden, Bexhill and Hastings areas. Of course, I’m pleased for those areas”. Earlier last year I met with officers of East Sussex County Council and pleaded with them to include schemes to improve safety for walkers and cyclists using and crossing the dangerous C7 road which connects Lewes to Newhaven. Sadly they ignored my pleas leaving my rural area without funding as well as Lewes and much of the rest of the county.